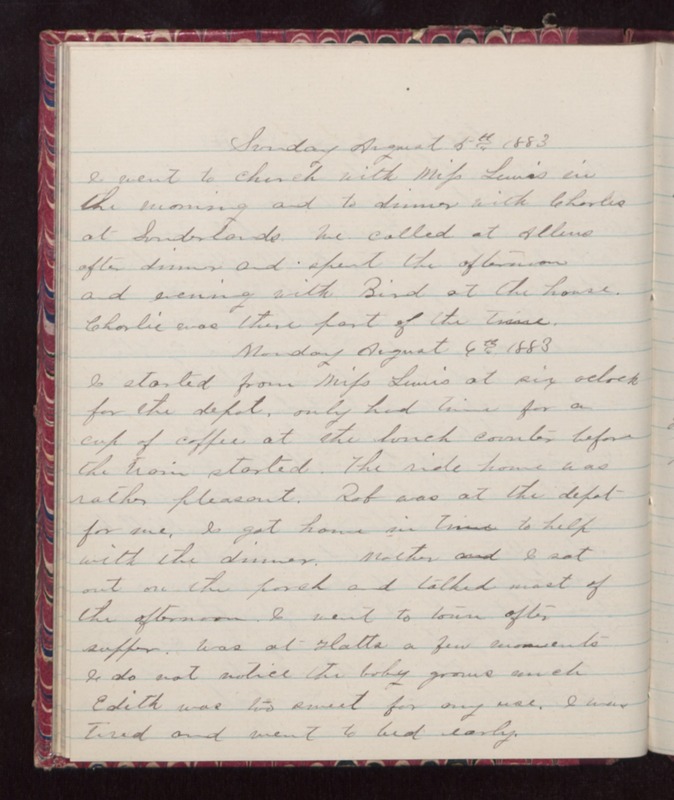 Sunday August 5th 1883 I went to church with Mifs Lewis in the morning and to dinner with Charles at Sunderlands. We called at Allens after dinner and spent the afternoon and evening with Bird at the house. Charlie was there part of the time. Monday August 6th 1883 I started from Mifs Lewis at six oclock for the depot, only had time for a cup of coffee at the lunch counter before the train started. The ride home was rather pleasant. Rob was at the deport for me. I got home in time to help with the dinner. Mother and I sat out on the porch and talked most of the afternoon. I went to town after supper. Was at Glatts a few moments I do not notice the baby grows much Edith was too sweet for my use. I was tired and went to bed early.